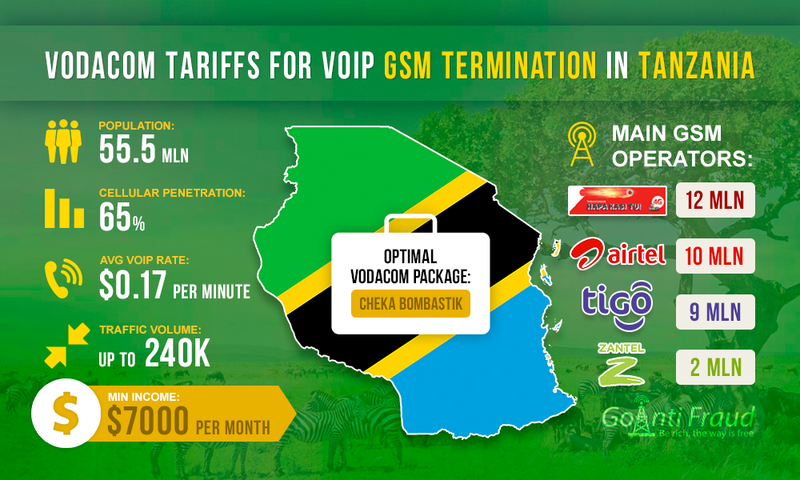 Tanzania is a promising area for setting up a VoIP GSM termination business. When voip international call per minute is about $0.17, prices for local calls in the country are minimal (2.5 cents). Due to this, the terminator is able to earn large sums in Tanzania. The most suitable GSM operator for voip termination service in Tanzania is Vodacom. It is the largest cellular company in the country, which covers a large part of the market. The subscriber base of Vodacom has more than 12 million users in Tanzania. Using this operator’s packages, you will be able to have the maximum amount of traffic paid off. The main thing is to choose the right tariff plan so that the difference between the cost of overseas calls and local can be as much as possible. This will increase your chances of getting a high profit. Red. The cost of the call in the country is $0.04 per minute ($0.00069 per second). Ongea Deilee. One minute costs $0.028. However, after you have spent 10 minutes, you get 60 free minutes to make local calls. Cheka Bombastik. This tariff includes free calls in the network. There are tariff plans for 1 day, 1 week and 1 month. The most appropriate for VoIP termination are a week-long package for $4.59 (180 minutes available) and a monthly package for $9.18 (330 minutes available), for $ 13.77 (550 minutes available), and for $ 22.95 (1,000 minutes available). You can run a profitable VoIP termination business in any country by connecting your equipment to GoAntiFraud. Our integrated solution greatly reduces risks of blocking of SIM-cards by AntiFraud systems. We also offer NewBusiness packages for beginners that provide everything necessary for a successful start, including a set of VoIP equipment by GoIP, EjoinTech & ChinaSkyline. The most optimal Vodacom tariff plan for the termination is Cheka Bombastik for $22.95 a month. Using this package, the minute of a local call will cost $0.022. You will get 1,000 minutes, which will last for 3 days of work, if the 2n voip gateway will terminate for 5-6 hours per day. It's just the right time, given that the antifraud systems block SIM-cards within 3-5 days. During these days you can use the minutes so that you will feel sorry if the card is blocked. Terminating for 5-6 hours with an eight channel gateway, you will make a profit of about 7-8 thousand dollars a month. VoIP GSM termination can bring you a lot of profit if the SIM-cards are provided with reliable protection against blocking. Proven GoAntiFraud tools can simulate human behavior in GSM networks for efficient disguise from Antifraud of mobile operators.